When looking for the best cheap mechanical gaming keyboard under $100, I really had to make some difficult decisions as there were just so many high-quality keyboards at affordable prices. Eventually, I narrowed it down and picked the top 10 keyboards that I found under $100. 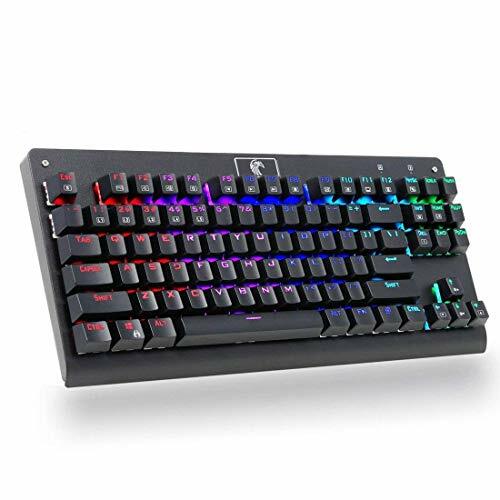 This list also has mechanical keyboards that I’ve found that were under $50 for any people who are on a tight budget and are really looking for a bargain. So, now without any more delays let’s jump right into this list! Also, if you’re looking for a gaming mouse then check out my post on the best cheap gaming mice under $50. I know not everyone has the budget for an expensive mechanical keyboard, so I’ve decided to include a few high-quality cheap mechanical keyboards that are great buys for under $50. These keyboards won’t be able to compete with the more expensive ones, but they will get the job done and are excellent buys in their own right. This is a newer keyboard on the radar from manufacturers called Lsea&M. This keyboard has all the right things to it that should make it a very good keyboard. I put this at number 10 because of how new it is, there aren’t a lot of testers out there to put it through the ringer. 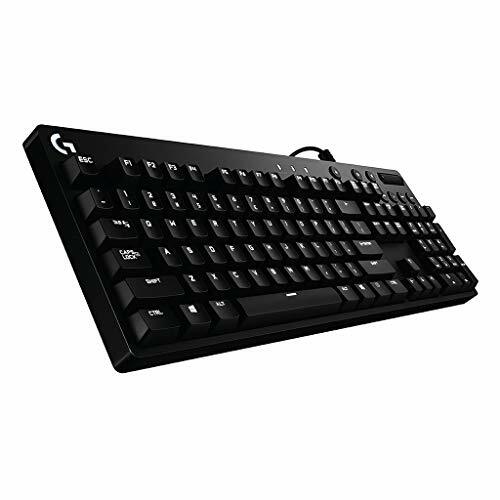 GAMING KEYBOARD:104 Key Mechanical Gaming Keyboard with round Switches designed for greater durability,this keyboard audible click sound, and crisp, precise tactile feedback for ultimate Gaming performance. 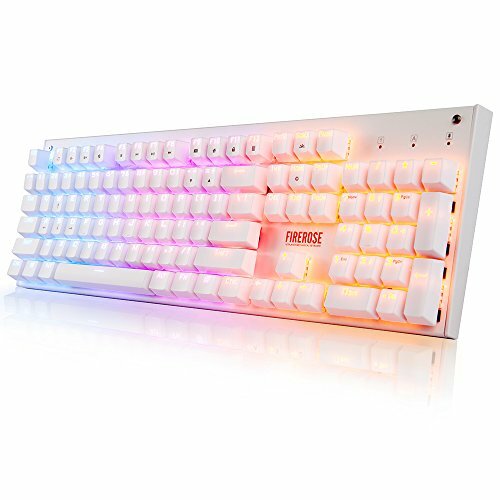 RGB MECHANICAL KEYBOARD: RGB Backlit Mechanical Gaming Keyboard with Double-shot injection molded keycaps offering crystal clear uniform backlighting and lettering that doesn't scratch off. 9 different RGB lighting modes deliver dynamic, vibrant backlighting. This keyboard takes a little bit of a leap of faith – as it’s a new kid on the block. I’m always up for trying new products and with the fast & easy return policy of Amazon I always take the “chance”. This keyboard has one quality that I truly like – the keys are waterproof. I haven’t tested the full waterproof nature of the keys but I have spilled a full water glass over it (thanks to my daughter for testing…) and there were no issues. The keyboard is based on a version of the Cherry Blue key, which means they’re going to be loud when typing. The reviews are a little speculative, having such a high review star rating always puts my “don’t trust” glasses on and I haven’t been able to test the longevity of the keys at all. It is difficult to find a quality cheap mechanical keyboard we all come to expect. With all that being said, the keyboard is a different design with their rounded keys and should be a good fit for your budget. While this keyboard doesn’t use the traditional cherry MX keys it does bring a lot to the table with its low price, and excellent tactile response. Earning it a spot on this list for anyone who is one a budget. Double-colored injection molded keycaps with long durability and 100% anti-ghosting with 104 key rollover on USB, over 50 million times key-click lifetime. 1stPlayer did a good job when making this keyboard feel as close as they possibly could to the true cherry MX blue keys and while If I didn’t know that beforehand they could’ve easily convinced me. One unique feature that the Firerose gaming keyboard brings to the table would have to be the full 104 anti-ghosting keys that are a necessity for anyone who’s going to be using macros. It’s also waterproof which is a good feature for anyone who is prone to spilling things on their keyboard. I would be cautious with any keyboard touting to be waterproof – I always recommend keeping drinks away from your desk if you’re clumsy at all. I think the keyboard will hold up to a drink, but I wouldn’t rely on letting the liquid just sit on the keyboard either! The keys are a custom designed, to replicate the cherry blue key. Remember, the cherry blue key is the loudes of all the cherry mx series of keys – so be aware. The adage “you get what you pay for” still may apply here when you’re looking at such a cheap mechanical keyboard. There may be issues after using the keyboard for a while. All in all though, this keyboard is a great cheap mechanical keyboard. If you can get past the fact that this keyboard is tenkeyless, then this is a great mechanical keyboard for gaming. Not only is it compact, but it’s also affordable making it a great buy for anyone on a budget. If you’re looking for an actual mechanical gaming keyboard under $50, then the AULA Gaming keyboard is one of your best choices at this price range. Yes, it’s small compared to some of the other keyboards on this list, but it’s a high-quality gaming keyboard that is worth every penny. The AULA gaming keyboard brings a lot to the table when you consider that it’s a little under $40 at the moment. Unlike some of the other keyboards that I’ve listed here, this is a REAL mechanical keyboard that provides excellent feedback and little to no ghosting. My only main issue with this keyboard for gaming would have to be the fact that it doesn’t have alternate keys that could be used for gaming which could put it at a disadvantage if you need a lot of macros. It might also take some time to adjust to the layout of the keys on a compact keyboard. 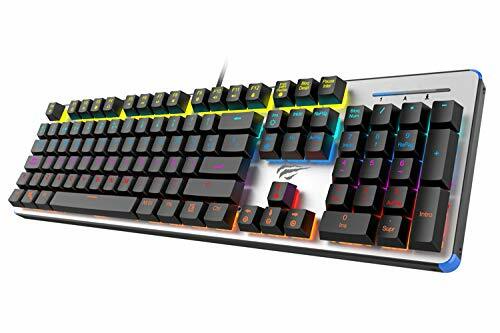 My recommendation would be to go with a keyboard that is mechanical feeling at this price range if you’re okay with the hit you’ll take in build quality, but if you absolutely must have a cheap mechanical keyboard, then this is probably one of your best choices at this price range. As long as you’re okay with the fact that this keyboard is tenkeyless, then it’s a great keyboard for the price that provides a lot of value and is easily my second pick for the best mechanical gaming keyboard under $50. [REAL Mechanical, DIY Replaceable ]-- Innovative pluggable design mechanical keyboard allows you to solder-free replace all the switches by yourself. It comes with 5 PCS of free switches (Gaote switch/ Otemu switch) for you to replace. 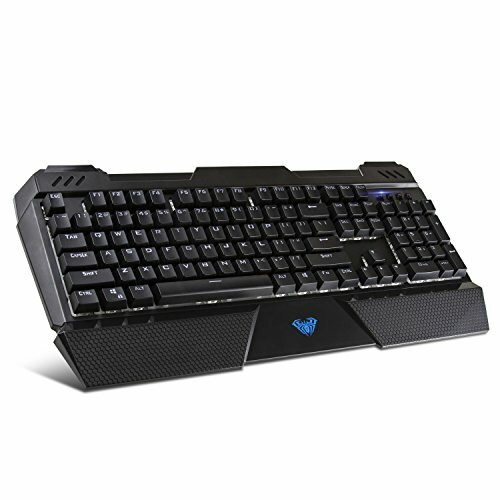 [9 Backlit Modes] -- Easy to change mode by pressing FN+Ins; 8 modes gaming keys lighting-up patterns. Support selectable keys lights . [Anti-ghosting 87 keys/n-key rollover]-- Allows multi-keys to work simultaneously in high speed. Each key is controlled independently, which allows faster response in games.High Responsiveness and Durability -- Mechanical keys with medium resistance, nice click sound, and tactile feedback. Tested for over 50 million times keystroke. [USB2.0 ]-- Compatible with Mac OS X,Windows10, Windows 8, Windows 7, Windows XP, Windows VISTA and Linux. Honestly, if this was a full keyboard it would be my top pick for someone looking for a cheap mechanical keyboard under $50, but considering that it’s tenkeyless it’ll have to settle for the second best. Make no mistake, though; this keyboard is a fantastic buy for the price and anyone who gets it will be more than satisfied. One of the coolest features that the Mechanical Z-77 has would be the different backlighting options. Sure you have the basic WASD light up, but you also have a lot of other options that make this keyboard stand out from the crowd. The Z-77 is also 100% anti-ghosting which is amazing when you think about it considering the price range. There aren’t many negative aspects when it comes to the MechanicalEagle Z-77. As long as you understand that it’s tenkeyless, you have no other issues to worry about. If you’re looking for the best budget mechanical keyboard that has a smaller footprint, then the MechanicalEagle Z-77 is hard to beat considering that it’s 100% anti-ghosting and displays such a simple yet effective design. If I had to pick a mechanical keyboard under $50, this would be my pick without a doubt. All of these mechanical keyboards are more than worth the price and are currently priced between $50 and $100. If you’re looking for a Mechanical keyboard that’s going to last you for a long period of time then these are the ones you should primarily look at. 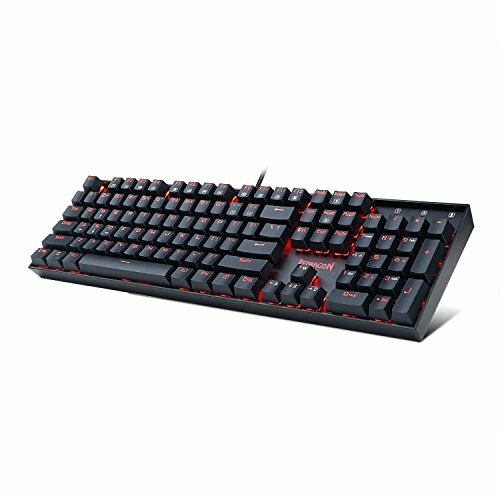 For its price this cheap mechanical gaming keyboard is hard to beat, if you’re looking for an actual mechanical keyboard under $50 that’s also compact then the AULA sapphire gaming keyboard was made specifically for you. I usually don’t like to put a brand twice on the same list, but AULA releases some of the best cheap, high-quality mechanical keyboards around. The AULA Sapphire is a FULL mechanical keyboard that seriously packs value. The reason this keyboard is at the top of this list is because of how much value you’re getting when you compare it to similarly priced keyboards. Not only are you getting a full keyboard, but you are also getting a wrist rest and other features that are typically only seen in more expensive keyboards. With all of those features on top of the quick response time and the excellent key feel. This keyboard is virtually impossible to beat for the price. The AULA Sapphire has cherry blue switches, which are again going to be on the loud side – but if you like the blue switch, this keyboard won’t dissapoint. The only issue I have with this keyboard is that it’s not backlit which can be annoying if you like to game in dark areas and don’t know the keys by heart. Other than that this keyboard is the total package. If you’re looking for a cheap mechanical keyboard for around $60, HAVIT’s keyboard is really something that you should check out. Not only are you getting one of the best budget mechanical keyboards with no anti-ghosting and blue switch keys, but you’re also getting a keyboard with some amazing build quality for the price too. When you purchase the HAVIT, you’ll be getting floating keys with blue switches that provide a fantastic response and no ghosting whatsoever. You’ll also be getting a one year warranty if you still have any doubts. Too much of a good thing can be a bad thing as the saying likes to go, and that whole heartedly fits the HAVIT. While I love the excellent sound, you get when you click each key. It might be a little bit too loud for some people. If you work in an environment where you need to keep silent, this keyboard is not for you. If you like to hear every key, you press then this is going to be a good keyboard for you. When it comes down to it would I recommend HAVIT’s keyboard? Wholeheartedly! Not only is this thing fully backlit, but it’s also affordable and is a full sized keyboard. While this is a little more expensive than a tenkeyless, it’s more than worth the upgrade. If you’re looking for something that will last you for a long time, then this is one of my top picks. Another great cheap mechanical keyboard for $60 would have to be Redragons K551. Not only are you getting something that won’t break the bank, but it’s also a full keyboard with a host of features that really set it apart. This isn’t the first time I’ve reviewed Redragon products, and I doubt that this is going to be the last. The Redragon K551 is a great mechanical keyboard for someone who is on a budget, but still wants something that will last a long time. It’s not the best keyboard on this list, but its features make it a stellar buy for someone who’s looking for the best budget mechanical keyboard. Earlier I said this keyboards tactile response is on the lower side for a mechanical keyboard, and while I love this feature I know some people may find it disappointing which could be considered a negative for some. Other than that I really can’t find anything wrong with this keyboard. When you add in the fact that this keyboard’s build quality is just fantastic, you get an item that is a complete steal for its current price. 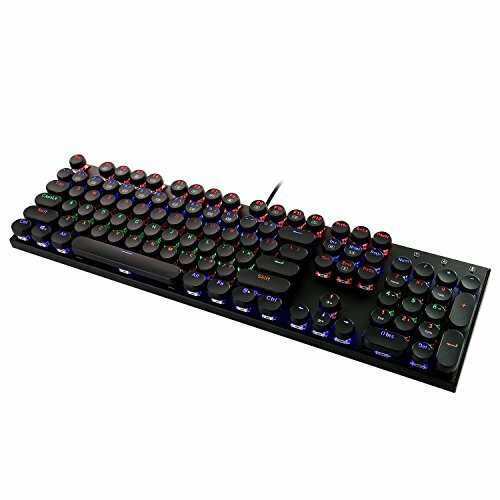 Considering that HAVIT’s keyboard is in the same price range as Redragon’s which one’s better? I honestly would go off of aesthetics and whether or not you want a mechanical keyboard that has louder tactile response or one that is on the lower side. Personally, I’d go with Redragons, but I know other people who’d prefer HAVIT’s instead. Logitech has produced a very good gaming keyboard. Not does it have no ghosting whatsoever but it’s also fully backlit and gives you the choice between cherry brown or cherry red switches at purchase. This is the first level of truly mechanical keyboards from Logitech. Truly an amazing buy! I think another great plus for this gaming keyboard are the included media keys. In doing our review, we found it difficult to find a gamind keyboard that has media keys, volume control and the traditional Cherry MX buttons. The Logitech software is really quite useful and I consider a benefit. For some, having to install software is a negative if you plan on moving the keyboard from one computer to another. The software allows you to customize different lighting choices including brightness. The Logitech Gaming software can also match the same light patterns with other Logitech G devices if you have them. You can also specify exactly which keys should be disabled when the gaming button is pressed. Logitech gives you the ability to create 12 “G-Keys” (on the F1-F12 keys) so you can create complex recordings of keystrokes (know as macros). The back lighting offers a few programmable options, but you need to make sure the software is running to ensure the proper performance. Like many gaming keyboards, the Logitech G610 has a Game switch mode to disable Windows and Menu key while you’re gaming (gamers know how great of a feature this is, and should be considered a must). This is probably the best compact mechanical gaming keyboard under $100. Tt esports did a good job when designing the Poseidon, and I honestly have nothing but praise for the keyboard. The G610 also has a full keyboard layout, which I think is a benefit – some looking for a smaller profile will disagree. If you are in the market for a long-lasting compact mechanical keyboard, this is a fantastic pick. Razer has done it again! The Razer Blackwidow ultimate is easily one of the best mechanical gaming keyboards under $100. If you’re looking for something that’s stylish, but will also allow you to game at your full potential then this is it. It just wouldn’t be right to have a top 10 gaming list without having Razer in it. 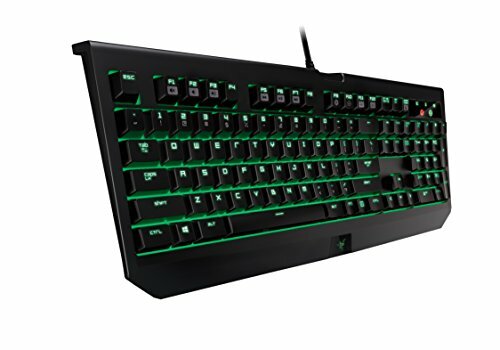 I don’t know how they keep producing so many good products, but they also have one of the best mechanical gaming keyboards under $100. Not only is it flashy, but it also has the functionality to back it up. If you’re looking for something that’s pretty on the eyes and are willing to pay for it, then the Razer Blackwidow full ultimate was made specifically for you. One thing I like about this keyboard would have to be the fact that Razer has their own mechanical switches which are excellent if you ask me and easily compete with Cherry MX switches ( and in some ways surpass) used by other manufacturers, especially when it comes to gaming. Oh yeah, you also get a 2-year warranty which is always reassuring. Honestly, I love Razer, and it’s not just because there some famous brand, but also because they always put out high-quality products that put most of their competition to shame. I have nothing negative to say about this device itself, but the customer service is a little lacking. In the end, I’d recommend this product to anyone as it’s just a good buy. While there are so many mechanical keyboards makers, Razer still somehow manages to dominate the market which speaks volumes. This thing is a beast! For under $100, I honestly feel that it has no equal. If you’re looking for the best mechanical keyboard under 100 dollars then you should definitely check this out! While I love Razer, I do think one company has them beat when it comes to making cheap mechanical keyboards, and that company is Corsair. Some of you might not have ever heard of Corsair, but let me tell you, they make some awesome gaming products, and this mechanical keyboard has to be one of their best. The thing that sets the STRAFE apart is the excessive amount of customization it offers. When you first go to purchase the keyboard, you’ll get options on what switches you want Brown, Red, or Blue. Each of these cherry MX switches gives a different response each time you click them. I prefer the cherry brown switch – I’ve learned the perfect button spot so I can achieve a very fast double tap key press without much effort – this does take some time to lear howerver. If you’re a writer, a lot of writers prefer cherry blue as it has that pronounced clicking sound (not great for late night writing if you have others who are sleeping!). If you’re really interested in learning about which Cherry button is best for you then I would recommend checking out This Lifehacker Post as they have done a very good job of describing each button. The keyboard also gives youthe ability to reprogram every key which means that this keyboard is a must for anyone who is trying to make a lot of macros. You literally have thousands of different options! One other cool feature is that the WASD and space bar is textured so that you have the best grip possible while gaming or doing any other tasks that could make your hands lose their grip. Obviously, this keyboard has no ghosting and amazing build quality as well, but just the other features that the lower priced cheaper mechanical keyboards don’t have really set Corsair’s keyboard apart. Honestly, I have no significant issues whatsoever when it comes to the Corsair STRAFE. Yeah, I know it’s not perfect, but for the price, it is just such a steal. You have so many options that just allow you to turn this keyboard into something that will fit all your needs for years to come. 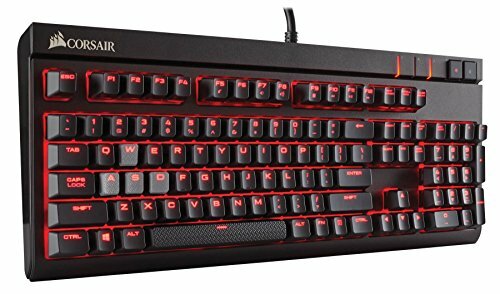 If I was trying to find the best mechanical keyboard under 100 dollar budget, then the Corsair STRAFE would be my pick. 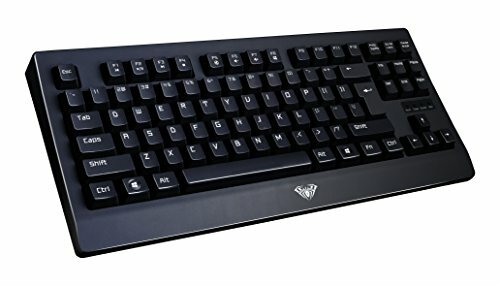 Many people seem to think that getting a cheap mechanical keyboard is impossible, but throughout this list, I’ve shown you some keyboards that are even less than $50 that still provide insane amounts of value. If you would like to add something to this list or just need some further help in finding a good mechanical keyboard on a budget, please feel free to leave a comment below and I’ll get to you as soon as possible. If you found this post to help shed some light on all the different options you have available; please like and share this post so you can help other people as well! Thank you for the guide what a pleasure to read and helped me as well! At work, I’m using Filco Majestouch 2 Ninja, but am looking for something a little different for gaming! Thanks for the guide, i love it! Thanks for making this list of affordable mechanical keyboards. Actually found a really nice that I’m going to give my brother! Thanks for posting this list! It’s so incredibly useful!! Narrowed my search down by a lot!! Keep up the good work!